As the original walking holiday company, we have been creating superb holiday experiences for walking clubs and groups of friends since 1946. Every year thousands of group organisers trust us to organise their group walking holiday for them. Our team of planners and avid walkers will share their knowledge of the best destinations to visit and our expert Private Groups Team will take care of all the finer details of your travel arrangements, so all you need do is look forward to a stress-free and perfectly organised group walking holiday. We believe it’s a team effort and together we’ll find the perfect group holiday for you. Why book with RWH Travel? Our holiday itineraries are planned by people who are as passionate about walking as you are. We explore stunning landscapes across the UK and worldwide, from iconic walking trails to the more intriguing, lesser-known places to satisfy your group’s curiosity. Every day is designed to surprise and delight your group and with an exciting family of three distinctive travel brands, we have all your holiday aspirations covered. Choose from over 150 holidays in 60 countries with Ramblers Walking Holidays. Set sail for a walking holiday with an added nautical twist with Cruise & Walk in association with Fred. Olsen Cruise Lines. Or enjoy leisurely walking, sightseeing and good food with Adagio. We have something for everyone and are able to deliver you the very best Private Group holidays. With their infectious personalities and caring qualities, our leaders are there to make your group holiday successful. Spanning a wide range of ages and backgrounds, they are all worldly wise. Imparting their specialist knowledge of our tried and tested itineraries, they are an invaluable source of information when it comes to culture, history and highlights. They will guide your group to the familiar and off the beaten track, so you get a taste of each destination from the inside out, whilst gaining a real flavour of life as a local. Every group is different and that’s why we offer a range of walking grades to suit all ages and abilities. 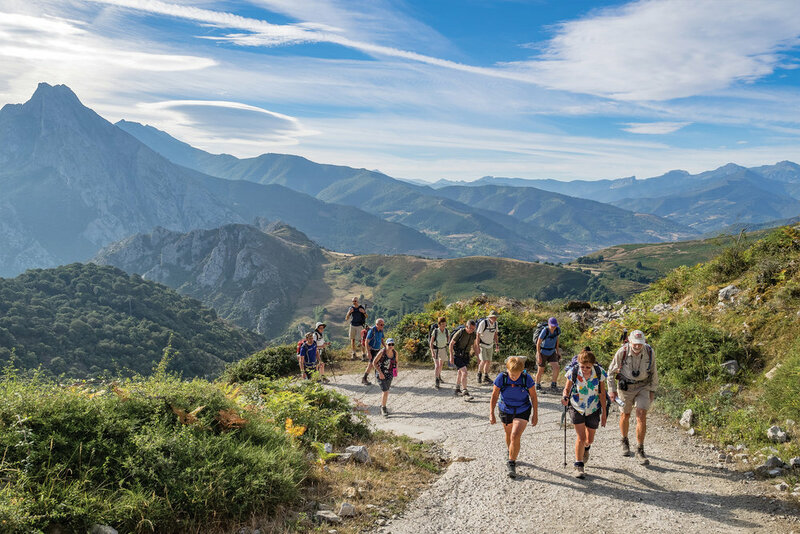 Whether you want to linger longer to take in city sights, bound across rugged countryside or take on the toughest of terrains, perhaps even do a combination of different walks, our holidays are graded to match your group’s ability and sense of adventure. We can also offer a range of durations, multi-centre holidays, regional airport departures and a choice of upgrades. It’s your holiday and we want your group to enjoy it their way. As a not for profit social enterprise, through our charities and initiatives we are able to give something back to the places and communities we operate in. The Ramblers Holidays Charitable Trust supports walking projects and charities both in the UK and overseas. Whilst The Walking Partnership helps provide direct financial support to local walking clubs throughout the UK. If you’re a member of a walking group it’s free to join us as a partner. You will earn rewards and funding of up to £30pp for your walking group every time you or your group members book a holiday with us. We are also the official walking holiday partner of The Ramblers. We’ve invested millions of pounds, for more than 70 years, to educate and encourage everyone to look after our world today, for others to experience and enjoy tomorrow. Our knowledge and heritage in adventurous travel spans seven decades. When you holiday with us your group will be in the safe hands of experts. We are fully bonded and regulated with ATOL Licence, plus members of ABTA and AITO authorities for 100% peace of mind. Plus, we are a BA Preferred Partner with our own in-house flights team who are adept in large group bookings. Add to that our Best Price Guarantee and you’ll be hard pushed to find a better value or more financially secure group holiday. Organising a group holiday can be an exciting but an onerous responsibility. There’s so much to think about, so why not leave the hard work to us? Our Private Groups Specialists can put together specific walking programmes for your walking club or group of friends and if our brochured arrangements don’t suit you, we will aim to adjust a holiday to suit your needs. We want your group to travel with us not just once, but for many years to come and as a thank you for your continued loyalty we offer the following discounts and rewards. Call today to share the adventure and share the savings! Always on hand to deal with even the most challenging requests our Private Groups and Reservations Team are ready to take your call. If you’d prefer to meet in person, why not arrange to come and visit our head office at picturesque Lemsford Mill? You can chat through your group holiday requirements over tea or coffee in our beautiful Hertfordshire surroundings, we’d love to see you. For more information please fill in the form below to email our Private Group and Reservation team. Thank you for your enquiry. I’ll get back to you shortly.